Instead, aim for the head and knock them down, rendering them vulnerable to further attack. Use Blizzard magic to keep them down longer. The Solid Armor is an Emblem Heartless that appears in Kingdom Hearts 358/2 Days. It serves as a boss in Agrabah. 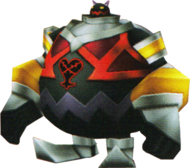 The Solid Armor is a large, rotund Heartless with a body covered almost entirely in armor. It has a small, black head, yellow eyes, and a jagged mouth. Purple horns appear atop the Solid Armor's head, and silver boots appear on its feet. Silver and yellow gauntlets cover the Solid Armor's wrists, and its breastplate is red and maroon in coloration. The armor covering this Heartless's lower body is black; a dark purple zig-zag wraps around its abdomen. The Solid Armor's Heartless emblem appears in the center of its stomach, just below its breastplate. The Solid Armor's name refers to its strength and large amount of HP. It also references the thick armor that covers this Heartless's body.